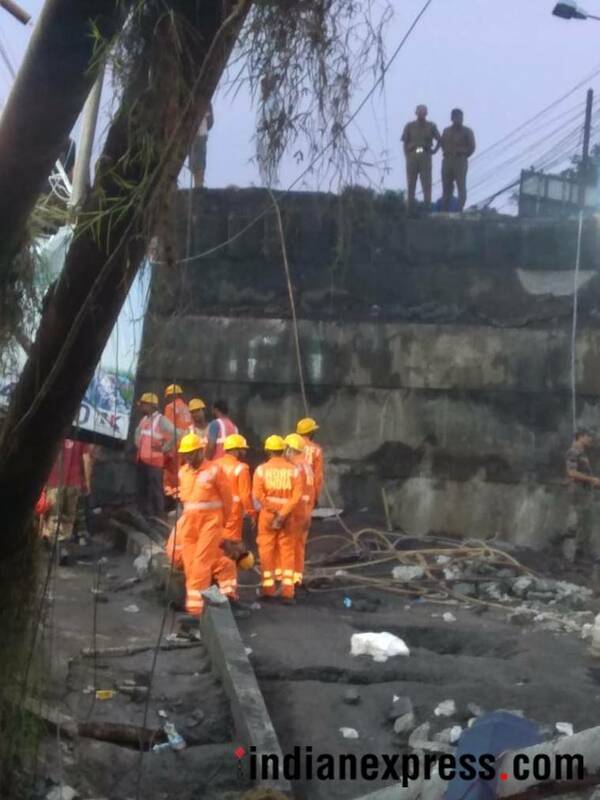 Kolkata Majherhat Bridge Collapse: Two people are yet to be traced in the debris of the portion of the Majerhat bridge which caved in Tuesday. State-run engineering and consultancy agency RiTES had in 2016 warned the West Bengal government on the precarious condition of several bridges in the city including the Majerhat structure but no action was taken, officials told PTI Wednesday. One of them said that the West Bengal government was about to undertake repair work on the decrepit Majerhat bridge but it got delayed due to bureaucratic wrangles. A suo moto case has been registered at Alipur police station against unknown people (maintenance agency) in relation with the Majerhat Bridge collapse in south Kolkata. The case has been filed under Sections 304, 308, 427 and 34 of the Indian Penal Code. 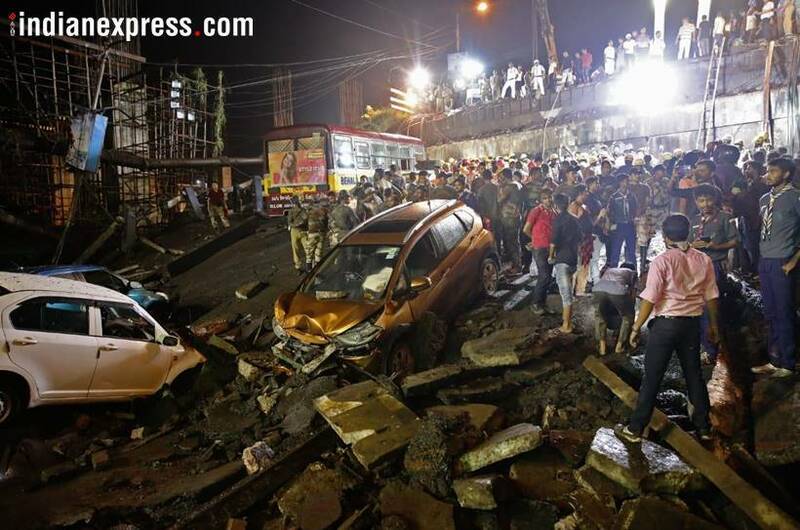 At least one person was killed and 25 others injured in south Kolkata after a portion of the Majherhat bridge collapsed on Tuesday. The rescuers did not find anyone trapped in the debris overnight, but a police officer said clearance operations was on full tilt on Wednesday morning. West Bengal Chief Minister Mamata Banerjee Wednesday arrived at the site where a portion of Majherhat bridge collapsed yesterday and took stock of the rescue operations, news agency ANI reported. Talking to media persons, she said though money and job cannot compensate lives but still a compensation of Rs 5 lakh has been announced for the person who died. She also assured that her government will look into the records of the bridges which require repairing work and will take necessary steps. A day after the collapse of a portion of Majerhat bridge in the West Bengal capital, a political slugfest erupted with the opposition parties on Wednesday accusing the TMC government of “neglecting” repair and maintenance of bridges and only painting various installations blue and white. State-run engineering and consultancy agency RiTES had in 2016 warned the West Bengal government on the precarious condition of several bridges in the city including the Majerhat structure but no action was taken, officials told PTI Wednesday. A lawyer mentioned before the bench of Calcutta High Court chief justice on Wednesday the collapse of a portion of Majerhat bridge and prayed that a report be sought from the West Bengal government on the condition of all bridges in the state, news agency PTI reported. 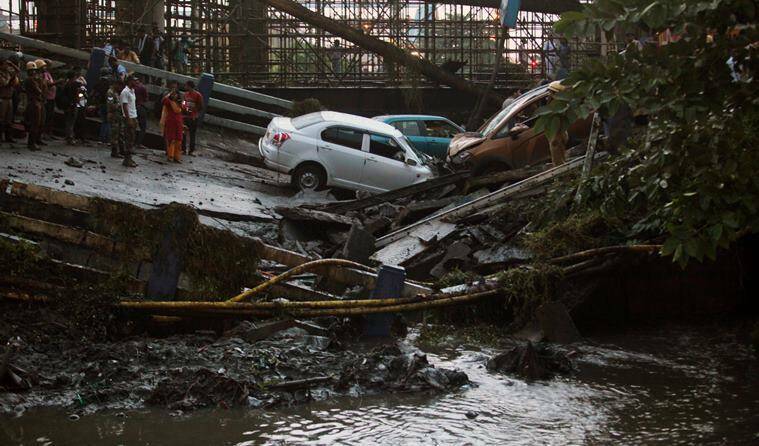 A part of the 50-year-old bridge on the arterial Diamond Harbour Road in southern part of the metropolis caved in Tuesday evening, killing one person, trapping several people and crushing many vehicles. Advocate Rabi Shankar Chatterjee mentioned before the court the issue of bridge collapse and urged the court to take cognisance of the issue. Suo moto case registered at Alipur police station against unknown people (maintenance agency) under Sections 304, 308, 427 and 34 of Indian Penal Code. Meanwhile, thousands of people residing in the south-western suburbs and vast areas of South 24 Parganas district are facing travel woes owing to closure of the arterial Diamond Harbour Road after the collapse of a section of the Majherhat Bridge. Speaking on the Majherhat bridge collapse, DC (South) Meeraj Khalid said that two people were still feared trapped in debris. "One death is confirmed. Two people are feared trapped in debris. Rescue operations underway. 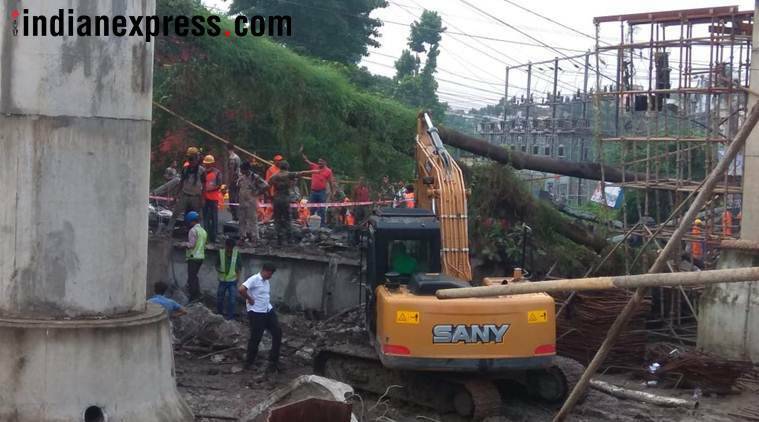 Beams of flyover are really heavy so it is taking time to cut them and rescue people. Case will be registered against those responsible," ANI quoted Khalid as saying. Rescuers are using drillers and cutting machines to barrel through concrete slabs and engaged sniffer dogs to find any signs of life beneath the debris. 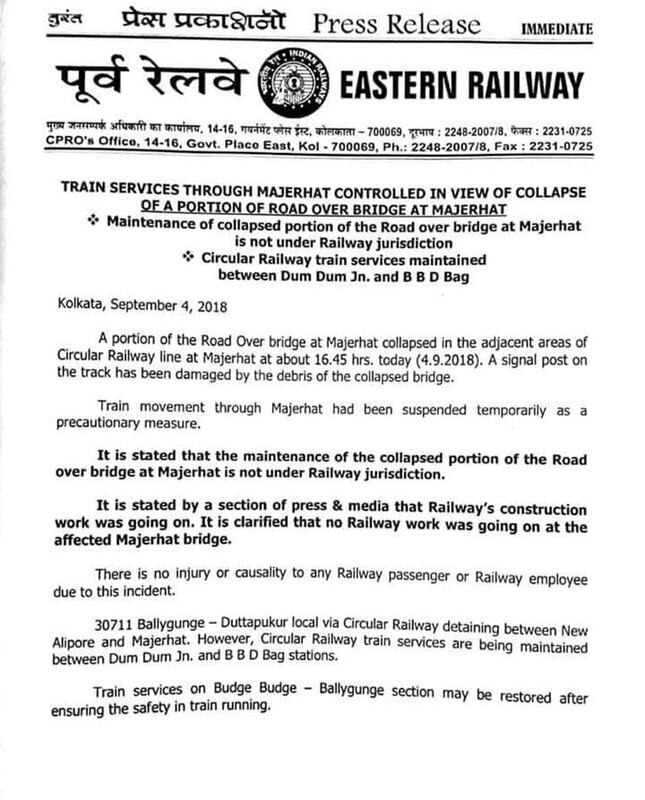 The Eastern Railway has asked the state-run RITES Ltd to probe the collapse of the Majherhat bridge and examine the safety of railway operations in it wake, IANS quoted an official as saying. "Our chief bridge engineer along with RITES team will be visiting the spot and it is a fact-finding team. The collapsed bridge was not under the Eastern Railway, but it was a railway over-bridge. That is why concerns are there," an Eastern Railway spokesperson said.RITES Ltd, under the aegis of Indian Railways, is a multi-disciplinary consultancy organisation in the fields of transport, infrastructure and related technologies. "They will investigate the possible reasons that caused the collapse and also examine the safety of railway operations under the bridge," the official said. The Majherhat bridge collapse is likely to have an adverse impact on the ongoing 16.72 km Joka-Esplanade Metro project. The elevated Majherhat Metro station is being constructed on a plot next to the collapsed Majherhat bridge. While the project has already suffered serious time and cost overruns because of encroachment and land issues, reports said the latest tragedy would peg it back by more one and a half years.Construction of Majherhat station will get delayed as taking the material to the site will be an issue, with a major part of the site being cordoned off for dismantling the old structure and re-erecting a new one. 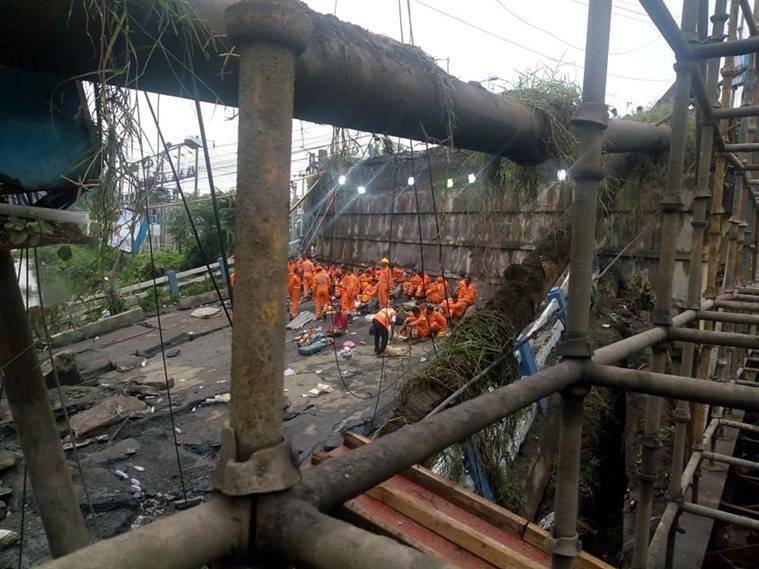 Quoting a source in the Rail Vikas Nigam Ltd (RVNL), the implementing agency of this project, TOI reported that work next to the spot where the portion of the bridge collapsed will be suspended for some days. A blame game over the Majherhat bridge collapse incident has already started. State Urban Development Minister Firhad Hakim has said that heavy construction work of the metro project beside the collapsed bridge could have weakened its pillars. However, the City metro railway authority has ruled out any such possibility, IANS reported. The Eastern Railway too said it was not conducting any maintenance work at the accident site. 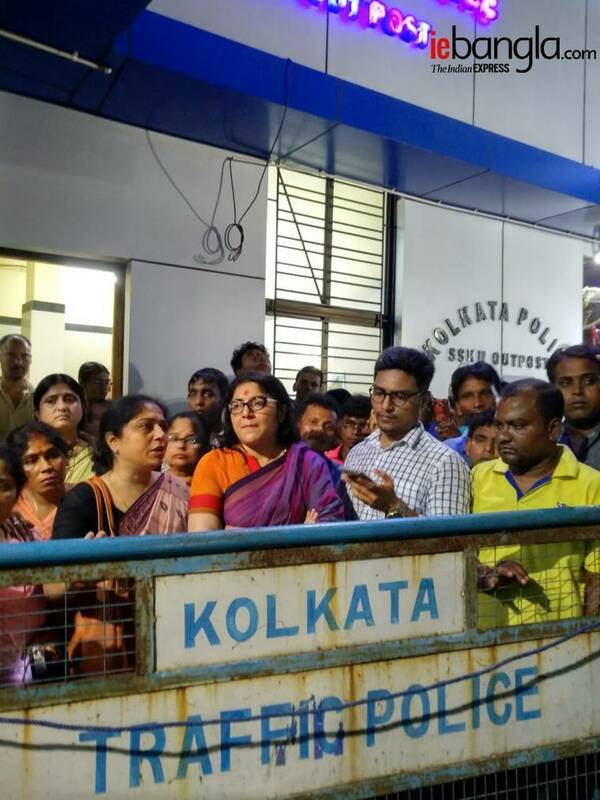 BJP MP Roopa Ganguly, who visited the Majherhat bridge collapse site on Wednesday morning, said the negligence of the Mamata Banerjee-led government was unpardonable and asserted that the structure was never maintained properly. "The negligence of West Bengal government is unpardonable. The repair was a complete eyewash with only white and blue paint and spraying some bitumen layers," she said. The BJP leader further said responsibility must be fixed at the earliest. "The structure was never maintained properly and that's why it just cracked. One should try and figure out who is responsible for this. If you don't go to the crux of the story then these things will keep on repeating," she tweeted. 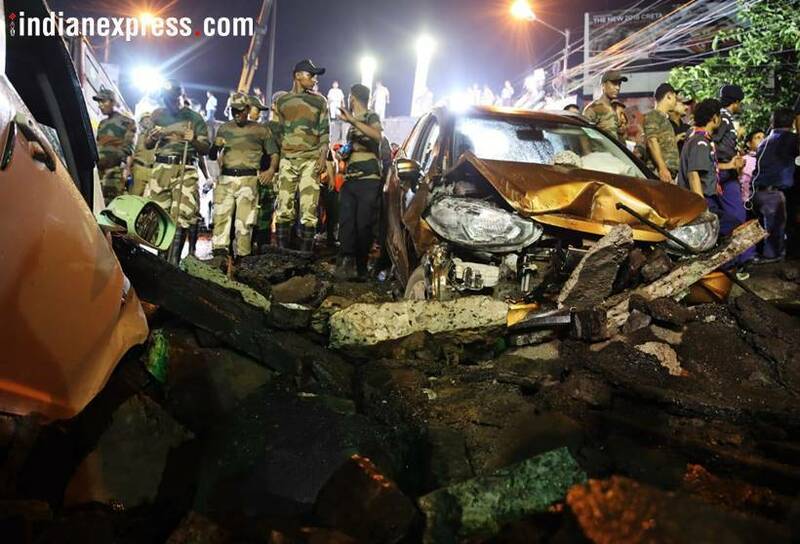 On the reason behind the collapse of the Majherhat bridge, Ganguly said the horizontal weight bearing girders got weakened due to excessive load, water seepage, crumbling plaster, and trees growing through the concrete. "Pillars of Majerhat bridge are intact and the horizontal weight bearing girders got weakened due to excessive load, water seepage, crumbling plaster, and trees growing through the concrete," she said. A member of the rescue team said removing the rubble would take some time and cameras were being used to find if anyone was trapped below the debris. "Our team is still working on the rescue. Overnight and this morning, we tried to dig holes on the concrete slab decks that caved in, to find out whether anyone is still trapped underneath. Cameras are also being used to find out what remains below the debris. Removing the rubble would take more time," he said, according to IANS. Four teams of the National Disaster Response Force (NDRF), fire brigade and personnel of disaster management teams are at the spot. Cranes have been deployed and gas cutters were being used for the rescue operation. Three columns of Army personnel are also present at the spot. Chief Minister Mamata Banerjee, who has cut short her Darjeeling trip, will be taking an afternoon flight from Bagdogra and will reach the spot of the tragedy around 2 pm. A TOI report said that the first of the red flags over the condition of the bridge were raised as early as 2015, when a PWD audit of the Majherhat Bridge had reported the structure unsafe. The warning was repeated in 2016 but was reportedly ignored again. Even in June this year, the traffic police had written to PWD seeking urgent repairs. However, when a PWD team inspected the bridge last month, it failed to raise an alarm over the cracks that had developed in the structure. The deceased has been identified as Soumen Bag (21), a resident of Silpara, Behala. Bag, who happened to be crossing the bridge spanning the Sealdah-Budge Budge railway tracks and a canal, died after he fell headlong into the wedge as the deck split into two. Speaking to IE Bangla, his friend Mrinmoy Bhowmick said Soumen's birthday was last Sunday but the celebrations were due. "Last Sunday was his birthday. We had decided to celebrate it at a later date. But now, it won't happen anymore," Bhowmick said. Train services from Sealdah to New Alipore have resumed. Traffic from Behala's Parnashree has been diverted. The government has made arrangements for extra buses so that commuters to Behala, which has a population of about 10 lakh. Meanwhile, tram services from Khidirpore have been suspended. Two new buses will ply between Taratala and Budge Budge and from Behala to Diamond Harbour. The recent incident is Kolkata's third bridge or flyover collapse in six years. In 2013, a 60-metre curved stretch of the Ultadanga flyover connecting the VIP Road to EM Bypass collapsed, taking down with it a goods truck. The driver and his helper suffered minor injuries. Luckily, the incident took place at 4:30 am when there was hardly any traffic. The flyover was commissioned just two years ago, in 2011, by the then Left Front government. In March 2016, a section of an under-construction flyover had collapsed in central Kolkata's busy Burrabazar area. 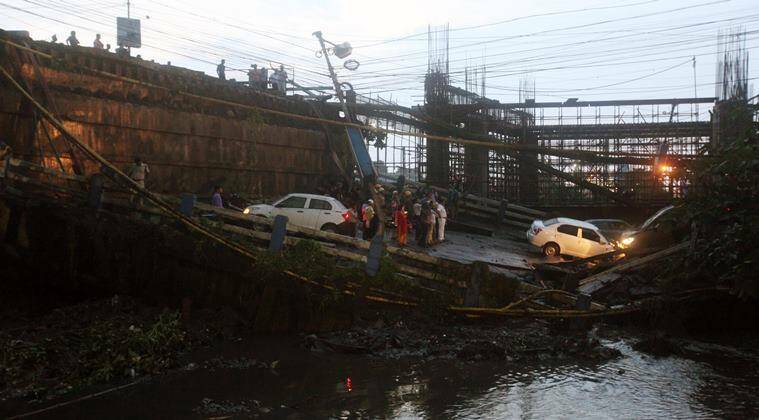 The Vivekananda flyover tragedy killed 26 people and nearly 90 people were injured. Ten employees of IVRCL — which was building the bridge — were arrested. A team from IIT-Kharagpur had cited poor design, materials and workmanship as causes leading to the bridge becoming unsafe at the portion between Ganesh Talkies and Girish park. The collapse of a portion of the Majerhat Bridge, a vital link between the city and the southern fringes, has affected transport services. A police officer said traffic movement through Diamond Harbour Road in Taratala area has been suspended following the incident. Traffic from various parts of South 24 Parganas and Behala area in the city are being diverted from Diamond Park area. Movement of traffic towards south-west Kolkata and South 24 Parganas have been diverted from Kidderpore and through Port area and Circular Garden Reach Road. Train services on Budge Budge-Sealdah line might be restored from Wednesday, a Railway spokesperson said. There are also going to be additional buses from Dharmatala to Diamond Harbor. Several questions are being raised about the reason behind the collapse. "The condition of the bridge was examined and a fit certificate was issued. Even then, why did this disaster strike? Are the vibrations of the Metro responsible for this disaster?" Rescue workers are trying to dig in a 30ft hole through the debris. Gautam Mondal, 53, is still missing, he used to cook for the metro workers. His son has come from Murshidabad after coming to know about this tragedy. Union Home Minister Rajnath Singh called the incident 'extremely tragic' and prayed for the recovery of the injured. 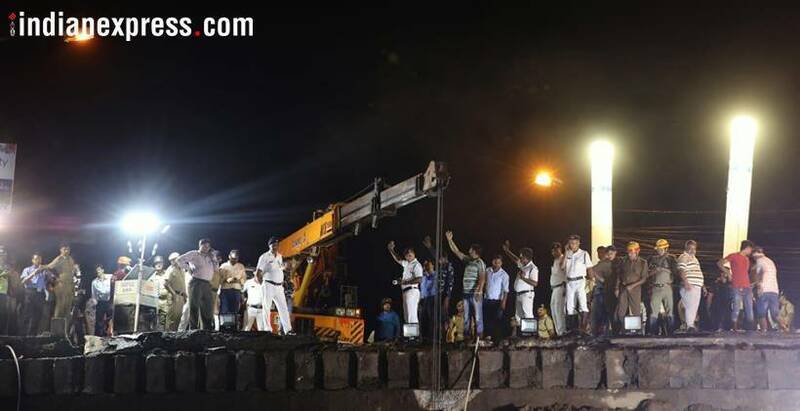 "The bridge collapse incident in Kolkata is a extremely tragic. Four NDRF teams have already reached the spot. One more team is on the way. I pray for the speedy recovery of the injured," he tweeted. Chief Minister Mamata Banerjee said an investigation led by the Chief Secretary will be started into the matter. She also announced a reparation of Rs.50,000 for those injured in the incident. The deceased, a male, has been identified as Soumen Bag. Meanwhile, the rest are undergoing treatment at CMRI and SSKM hospital. Security has been beefed up at the SSKM Hospital as people throng its premises in search of their relatives. A quick recap of the incident: At around 4.40 in the evening, a portion of the Majerhat Bridge collapsed. Five cars, three motorcycles and a minibus fell down with the portion of the bridge. 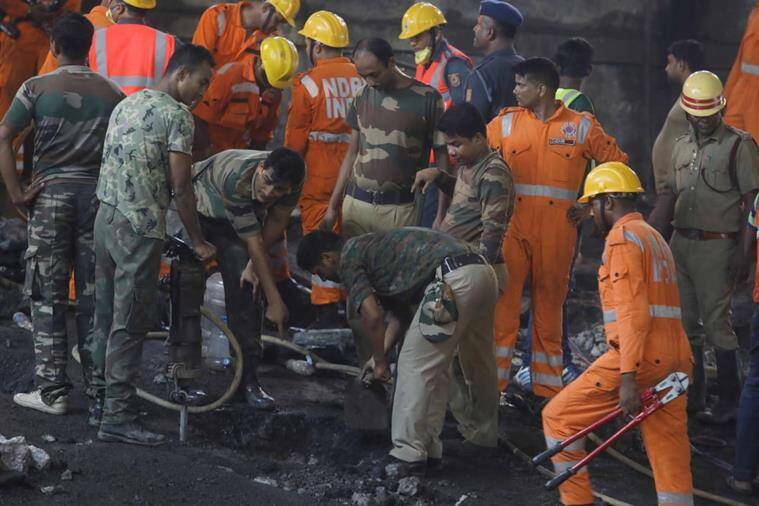 The rescue operation was launched immediately, with the Kolkata Police's disaster management team, fire brigade, Civil Defense and the NDRF working in tandem. According to fire service officials 25 people have been so far rescued who have received injuries. According chief minister Mamata Banerjee, nine injured persons have been admitted to CMRI hospital and 10 persons admitted to SSKM hospital. Some people were treated and discharged from hospitals. Private buses, cars and other vehicles were seen crushed on the bridge after the incident. 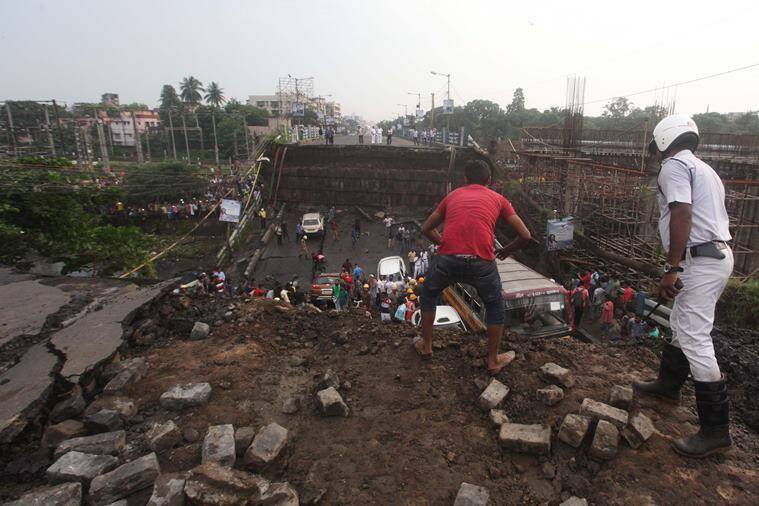 In 2016, a total of 27 people were killed and over 60 were injured after an underconstruction 2.2 km-long Vivekananda flyover had collapsed in a congested market area in north Kolkata. The flyover had come up under the JNNURM (Jawaharlal Nehru National Urban Renewal Mission) in order to ease Kolkata’s traffic congestion.